The Anime Archivist: Video Backlog: "Sound of the Sky (So Ra No Wo To)"
Video Backlog: "Sound of the Sky (So Ra No Wo To)"
Yes, I know moe isn’t a genre but a personal feeling for a character (as such), but hell, some shows, like this one, deliberately play that aspect up. Certainly the character designs of “Sora no Woto” are slightly pudgy looking and are almost dead ringers for some of the characters in “K-ON!” (there is a little bit of tea drinking this show as well...). However I did let this aspect of the show slide into the background and tried to enjoy the show for what it is. The show’s setting is a post apocalyptic world which has recovered significantly on the surface (though a lot of the complex technology is lost), but just out of frame, the world is coming to an end. The show is set around a small town which has a fort built up on the hillside. 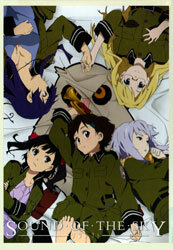 It is inhabited by the most unlikeliest soldiers; three bubbly teenage girls, one a complete klutz and dreamer who wants to become a bugler, another a shy child genius and the last a slightly naive gunner, and the two rather feminie commanding officers, only a few years older than their subordinates and barely at the legal drinking age. I’ll readily admit, it was really, really hard to accept that any sort of military would let a fort , regardless of how important it was, be manned by five girls, four of which are under 18. They’re so bubbly and cute it’s pretty much impossible to imagine any of them would have gone through any kind of basic military training. The first two thirds of the show are pretty harmless. It’s very much a slice of life show in which not a great deal happens that is all that threatening. There are some plot seeds (as I like to call them) sown the first episode which lead you to believe that the ending might be much more tragic than what it really is. There’s also little hints about the histories of the five main cast along the way. At about the seventh or eighth episode, things change up a gear or two. It is revealed that the fort is running an illegitimate business on the side (which the fort’s isolation gives a little credibility to, but the ages of those living in the fort undoes that a bit). Then we get to the meat of the plot with a lot of action in the last couple of episodes. It’s a really nice slow build up that really pays off in the end. I think the show really is otaku bait as such, as it is a slice of life show with cute “moe” girls, with a smattering of mecha towards the end and an insanely poppy and fun end theme song and animation. However it is extremely well produced and animated. Once you get past some of the more implausible elements, it’s really entertaining and possibly very accessible to non fans. The scripts and plot are pretty damn good too. The big downfall of this show for me was the utter lack of believability of the military assigning five girls under 18, three of them barely out of puberty to run a fort that’s out on the frontier. I found that aspect of the show a bit of a stretch. The Right Stuf have done a very good job on the set (like they always do). Maybe if it was just three discs in a keepcase like how Sentai do their titles I wouldn’t mind. However the extra touches such as the full colour booklet and bonus postcards are very welcome additions, especially for a series of this calibre. Overall this was a very entertaining series. A classic? Well no, not really, but this another show that is really solid entertainment. Yep, it is made for otaku, but it’s not junk. I’ll give it 7.5 out of 10.